Bobcats, turtles, and goats, oh my. As poor, young parents of three small children, my husband and I often searched for inexpensive and educational entertainment. One day my husband remembered hearing that there were fish tanks in the basement of the Widstoe Building, so we bundled everyone up on a brisk fall evening and drove to campus. Not knowing what we would find, we opted not to tell the children—with their short legs and shorter attention spans—where we were headed. “Just a bit farther,” we said. Finally we entered the building and started roaming the first floor halls in search of . . . who knew what. And then, there they were: the fish tanks. For the next 30 minutes, we all gawked at the starfish, the swimming creatures, the sea plants, and—everyone’s favorite—the huge lobster. Now when my grandchildren say, “Let’s go see the fish!” I am always willing to oblige. As a sophomore I worked early-morning custodial in the Benson Building. My 3:45 a.m. treks across campus usually included some wildlife—stray cats and occasionally deer. One day as I walked from Heritage Halls across the Harris Fine Arts Center (HFAC) parking lot, I saw something a bit scarier. First I noticed a kitten stopped dead in its tracks with its fur all raised up. I thought I had startled it, but suddenly it darted past me, running for its life. I looked over at the bushes to see what had scared the kitten so badly and saw an animal walk out. It was the size of a dog, but it walked like a cat and had pointy ears and a short, stubby tail. A bobcat! A bobcat had somehow made its way down from the mountains and onto campus in the middle of the night. I was really scared, but I knew it would chase me if I ran. So I kept walking. The predator followed me, staying close to the HFAC. I was terrified and kept imagining the news headline, “Maimed Student’s Body Found Near HFAC.” The bobcat lost interest in me somewhere between the Wilkinson Center and the Lee Library and headed back the other direction. Still, I kept looking back over my shoulder every few seconds to make sure it hadn’t decided to come back and eat me. I never went that way to work again—instead I took the long way down Campus Drive. I figured that way if I got attacked by a wild animal someone might drive by and be able to rescue me. My first attempt at scaling Mt. Timpanogos was the summer of 2001 while working at Aspen Grove Family Camp. My friend Sarah and I left as soon as work was over one afternoon and were making good time. At Emerald Lake, other hikers warned us of a few mountain goats that were near the trail, including a mother mountain goat with twin kids. As long as we gave them plenty of room, so they didn’t feel threatened by us, we would be okay. We continued on, undaunted, and soon forgot completely about the goats. 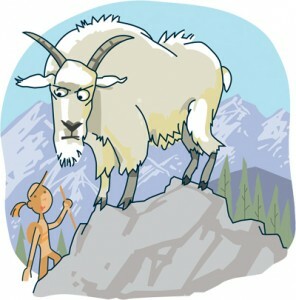 As we hiked the last mile overlooking the Provo valley, Sarah rounded a bend and found herself eye to eye with the mother mountain goat, her babes, and her pointy horns. We were so close I could see the bald marks on the goats’ knees. We gave them some room by backing off the trail and waiting. Then the worst happened: Sarah got impatient and threw a rock to scare the goats. Needless to say, the mother came after us, more nimble than us on the slippery shale. 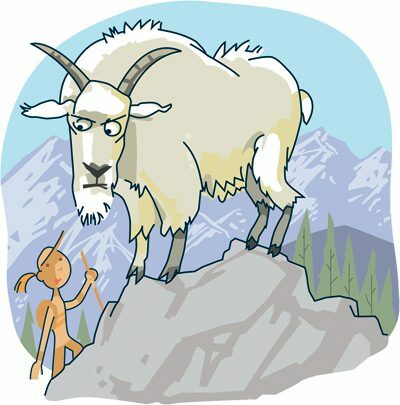 Sarah passed me as we scrambled down the trail, and I felt I had to decide which way to die: slipping off the mountain or falling prey to an omnivorous goat. But we outran the goat and both parties retreated to safety. We didn’t even try going back up the mountain that night; we hiked straight home. After many attempts at ascending Mt. Timpanogos, I have never been so close as that first try when I learned to never throw rocks at goats. As a freshman, life in Bowen Hall was an adventure. For me, the best part was preparing our own meals. Each week the six of us would contribute $5 and the designated roommate would head off to Carson’s Market to spend the precious $30 on groceries for the coming week. It was my week to prepare dinner. I had been to Carson’s Market, and among the items purchased was a large head of iceberg lettuce. As I was preparing a salad for our evening meal, I decided not to cut the lettuce with a knife but to tear it into pieces. As I tore the head apart, a small yellow, sickly looking frog leaped up toward me, landed on the cupboard, then jumped to the floor. Of course, I screamed! 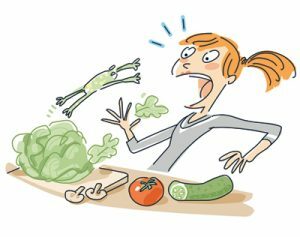 My roommate Dana jumped up on a kitchen chair and shrieked along with the rest of us, “How in the world did a frog get in our lettuce?” It took a few minutes for us to calm down, and then we grabbed the frog and took it outside. We were determined to tell someone at Carson’s about our lettuce frog. As you can imagine, they looked at us like we were crazy. Only then did we realize that we should have taken the frog as evidence. It was several months before anyone in our apartment dared to buy another head of lettuce. One fall afternoon during my freshman year, I returned to my quiet Maeser Hall apartment to unwind. I dropped my backpack on the bed and then flopped myself down. As I lay musing, I thought I heard a sound. Yes, there it was again—a scratching, scrabbling sound somewhere inside the room. I froze; I was the only one home, but I realized I was not alone. I craned my head up from my pillow, and my eyes fastened on my backpack as a small, black shape slowly emerged from the back side. Winded and disoriented from its exertions, it rested atop my backpack. I was stunned and relieved to find that it was simply a small bat, who had apparently hitchhiked home unnoticed. I gently gathered the bat. It was calm and never attempted to fly while inside. Once outdoors, however, it quickly took flight, leaving me filled with wonder at my unexpected encounter. Possibly because her decorations were so cumbersome or perhaps because she kept going the wrong way, Super Shell came in second. She did get to compete again the next day because she came in under a minute. Way to go, Super Shell!